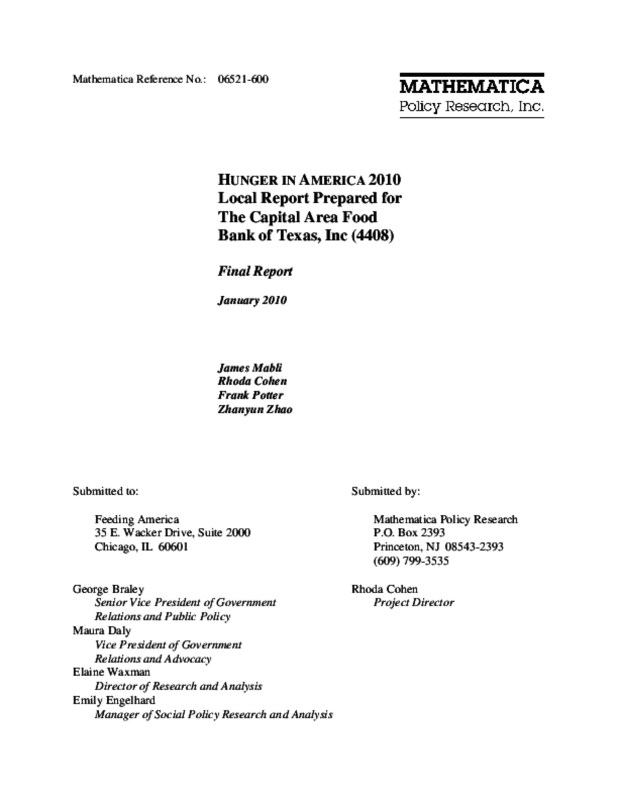 Hunger in America 2010 Local Report Prepared for The Capital Area Food Bank of Texas, Inc. This report presents information on the clients and agencies served by The Capital Area Food Bank of Texas, Inc. The information is drawn from a national study, Hunger in America 2010, conducted in 2009 for Feeding America (FA) (formerly America's Second Harvest), the nation's largest organization of emergency food providers. The national study is based on completed in-person interviews with more than 62,000 clients served by the FA national network, as well as on completed questionnaires from more than 37,000 FA agencies. The study summarized below focuses on emergency food providers and their clients who are supplied with food by food banks in the FA network. The FA system served by The Capital Area Food Bank of Texas, Inc provides emergency food for an estimated 284,900 different people annually. 41% of the members of households served by The Capital Area Food Bank of Texas, Inc are children under 18 years old (Table 5.3.2). Among households with children, 76% are food insecure and 29% are food insecure with very low food security (Table 6.1.1.1). 55% of clients served by The Capital Area Food Bank of Texas, Inc report having to choose between paying for food and paying for utilities or heating fuel (Table 6.5.1). 27% had to choose between paying for food and paying for medicine or medical care (Table 6.5.1). 23% of households served by The Capital Area Food Bank of Texas, Inc report having at least one household member in poor health (Table 8.1.1). The Capital Area Food Bank of Texas, Inc included approximately 325 agencies at the administration of this survey, of which 257 have responded to the agency survey. Of the responding agencies, 207 had at least one food pantry, soup kitchen, or shelter. 57% of pantries, 43% of kitchens, and 28% of shelters are run by faith-based agencies affiliated with churches, mosques, synagogues, and other religious organizations (Table 10.6.1). Among programs that existed in 2006, 85% of pantries, 45% of kitchens, and 42% of shelters of The Capital Area Food Bank of Texas, Inc reported that there had been an increase since 2006 in the number of clients who come to their emergency food program sites (Table 10.8.1). Food banks are by far the single most important source of food for agencies with emergency food providers, accounting for 82% of the food distributed by pantries, 48% of the food distributed by kitchens, and 47% of the food distributed by shelters (Table 13.1.1). As many as 88% of pantries, 58% of kitchens, and 63% of shelters in The Capital Area Food Bank of Texas, Inc use volunteers (Table 13.2.1). Title: Hunger in America 2010 Local Report Prepared for The Capital Area Food Bank of Texas, Inc.